The packaging of micro-systems relies strongly on the capability to bond different types of materials reliably whilst maintaining the microstructures and their dimensions. However, the bonding of different materials each with their specific physical and chemical properties frequently turns into a tedious, thus time consuming operation; often, the choice of materials and microfabrication techniques are limited by the bonding technique. Particularly challenging for bonding can be combinations of quartz, glass or silicon with polymers and metals. Here we demonstrate a rapid, low-cost, UV-irradiation based bonding method, which is suitable for the bonding and assembly of quartz-to-silicon, quartz-to-metal, quartz-to-polymer, quartz-to-quartz devices. We demonstrate in detail on the more challenging combinations, namely the bonding of a quartz slide to an aluminum sheet. In our example, the aluminum sheet contains the microfabricated structure. The same procedure is applicable for the other material combinations, i.e. quartz-to-silicon, quartz-to-polymer, quartz-to-quartz or quartz-to-metal for a metal other than aluminium; the main requirement for implementing our method is that at least one material is transparent to UV light. Draw your device design in any available computer aided design (CAD) software. As the surface roughness of the metal substrate can vary, a polishing step is recommended prior to the actual fabrication. Generate the G-code for the CNC machine using any CAM/CAD software. Two separate files are required: one for the polishing of the substrate, and one for the actual design. Clamp the aluminum substrate on the table of the milling device. Make sure that you do not bend the material. Set the initial coordinates (X0, Y0, Z0) for this work. Polish the aluminum substrate with 2 mm flat head end-mill. Change to the smaller diameter tool (0.25 mm). Mill the designed structure in the aluminum sheet with the 0.25 mm end-mill. 3. Cleaning the aluminum substrate from residues. Dust is removed first with water, and then the surface is cleaned first with ethanol, and then with compressed air. Finally the substrate is dried in an oven (120ᴼC, 30 min). 4. Plasma activation of the quartz microscope slide. Place the quartz microscope slide inside the Plasma Cleaner. The plasma treatment is a ‘surface process’, therefore the surface that is about to be bonded should be facing towards the center of the chamber. Evacuate the chamber until a working pressure of 500 mTorr at a constant inflow of air is established. Switch the plasma on at 27 W, which is the highest intensity available for the specified Plasma Cleaner. ‘Turn off’ the plasma after 90 seconds. Vent the chamber of the Plasma Cleaner by opening the needle valve and allowing air to enter through the flow meter. Remove the activated piece of substrate from the Plasma Cleaner. Align the substrates (and thus enclose the micro fabricated structures) by firmly pressing the activated quartz surface to the aluminum sheet. A fine interfacial gap is forming between the quartz and aluminum surfaces. In case you have a large chip or thin fragile substrates you may need to carefully clamp the substrates together. Prime the gap with the adhesive while holding the two substrates of your device together. In order to do so, place a small drop of adhesive to one edge, i.e. to the gap between the two substrates. The adhesive will flow into the gap due to capillary action. Thick substrates will be held together sufficiently by the adhesive film. The flow of the adhesive will stop at the edge of the microfabricated structures as a results of surface effects (surface tension and wetting angle). Inspect whether the device is completely filled with the adhesive. Add more of the adhesive if necessary. Cure the completely primed device by exposing it to UV-light, 365nm @ 100 W for 5 to 10 minutes. Place the device into the oven at 50°C. According to the supplier’s specifications, the bond reaches its maximum strength after 12 hours at 50°C. Alternatively, for temperature-sensitive materials, longer incubation times at room temperature are also feasible. 1. 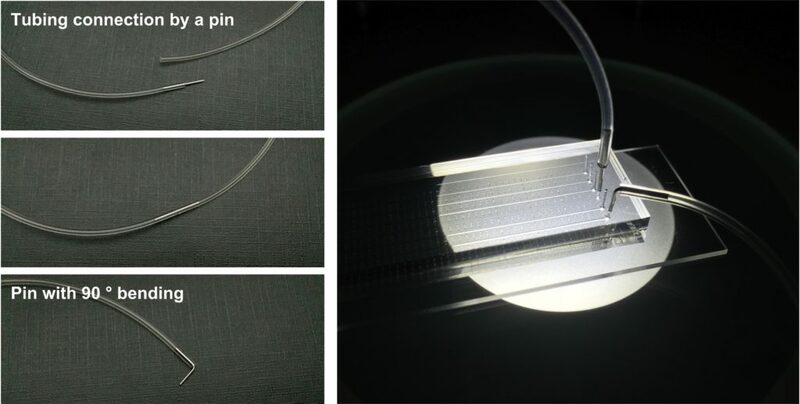 Hybrid microfluidic devices can be easily bonded. 2. The method is relatively simple and does not require clean-room conditions. 3. The method works with any UV transparent material as long as the surfaces are clean, smooth and as long as they can promote the capillary action necessary for the priming with adhesive. 4. It is an economic bonding method. An expected 30 mL of UV-curing adhesive should be enough for the bonding of over hundred microfluidic devices. Each assembly will thus cost less than £0.2 GBP (or approximately $0.3 USD). Q1. What processes do you use to create the holes in the quartz slide? A1. The quartz slides are drilled with diamond drill bit (Eternal tools, UK), 1 mm in diameter, and a bench drill (D-54518, Proxxon , Germany) at 1080 rpm. This is a slow operation as the process is closer to grinding rather than drilling. To avoid crack formations in the quartz slide and to cool diamond bit a droplet of water is applied on the surface of the quartz. After each cycle grinded quartz debris may be accumulating at the bottom of the hole; it can be removed by using a pipette and cooling liquid. Q2. Have you ever tried this method with channel geometries that are disconnected? For example, a channel layout shaped like an “O” that would prevent adhesive wetting from the edge of the slide? A2. We had bonded successfully channels with complex, serpent geometries. For “O”-shaped channels we use additional feed, a hole, drilled in one of the substrates that allows the adhesive to spread. Q3. Does the adhesive ever “burst” and enter the channels? If so, what methods do you use to minimize the chances of this happening? A3. Yes, it happens occasionally that the adhesive fills the channel. To prevent this: minimum amount of glue is applied at a time, and also the propagation of the front needs to be monitored. We wait until the glue reaches the channel edge, and then we place the assembly under the UV-light for curing. If the channel is filled with small amount of adhesive, the glue could be washed out with a bit of ethanol or acetone. Completely filled channel requires disassembly, cleaning with acetone or ethanol of the substrates. Afterwards, the procedure can be repeated with less glue. 1 Center for Advanced Biomaterials for Healthcare, Istituto Italiano di tecnologia (IIT@CRIB), Largo Barsanti e Matteucci, 53, 80125, Naples, Italy. 2 Dipartimento di Ingegneria Chimica, dei Materiali e della Produzione Industriale D.I.C.MA.P.I, Università di Napoli Federico II, Naples 80125, Italy. Conversely, casting a PDMS replica from a PDMS mold is challenging as both PDMS layers significantly adhere to each other and demoulding is, if at all, only possible after a careful manual cutting and peeling. A less fiddly but more elaborate approach is the passivation of the first PDMS copy by silanisation in order to reduce adhesion. Particularly, in order to prevent adhesion of the PDMS replica on the master, in a conventional process the master is treated with oxygen plasma to activate the surface and immersed for about 2 min into a silane solution (i.e., a mixture of 94% v/v isopropanol (Sigma Aldrich), 1% v/v acetic acid (Sigma Aldrich), 1% v/v Fluorolink S10 (Solvay), and 4% v/v deionized water) and then placed in an oven at 80 °C for 1 h, thus allowing a complete reaction of the master surface with the fluorinated polymer. This long and expensive process uses materials that are toxic if not removed thoroughly from the master. Recently Gitlin et al. proposed an alternative method utilising hydroxypropylmethylcellulose (HPMC) to passivate a PDMS mold4. Wilson and colleagues presented an “incubation” procedure using a 1% gelatin solution to passivate the PDMS mold5, but this method lacks the ability to control the gelatin layer thickness. Our tip shows a precise method for preparing a thin gelatin layer by spin coating technology which helps preserve the geometry of microstructures on the PDMS mold. In addition, the use of the spin coater makes controlling the gelatin thickness easier. Here we propose the use of a thin hydrogel layer created with spin coating technology or other thin layer depositing techniques as a passivating material which is easy to use and less toxic than other passivating materials. In addition, this process yields hydrogel coated microstructures since gelatin remains on the replicated structures unless it is removed by peel off. 1. 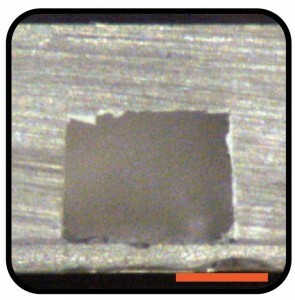 Mill microstructures and related inlet/outlet holes (in the case of microchannels) using a micromilling machine (Minitech CNC Mini-Mill) (fig. 1A-1B). To design a draft of the microstructures we created a layout with Draftsight (Cad Software). During micromilling, spindle speed, feed speed and plunge rate per pass were set to 12 000 rpm, 15 mm/s, and 20, respectively. 2. After micromilling, the PMMA master is ready to use. Pour liquid PDMS prepolymer (10:1) onto the master to fabricate a PDMS positive replica and cure at 80 °C for 2 h (Fig 2A-2B). The PDMS precursor is previously exposed to vacuum to eliminate air bubbles for at least 30 min. 3. Place the PDMS positive replica onto a spin coating stage, deposit a small (~1 ml) droplet of liquid 10% w/v gelatin, previously degassed with nitrogen for 10 min at the center of the substrate and then spin at high speed (2000 rpm for 20 sec) (Fig. 3A). Afterwards put the system into the fridge for 20 min at 4°C, to finalize the gelling process. Dehydrate the hydrogel layer at room temperature for 5 hours under hood aspiration. (Fig. 3B) Alternatively, prepare the gelatin coating via spray deposition. 4. The Hydrogel-PDMS positive replica (HPPR) is completely dehydrated and ready to cast a new PDMS replica. IMPORTANT: only use a curing temperature below 37° C when making replicas. 5. 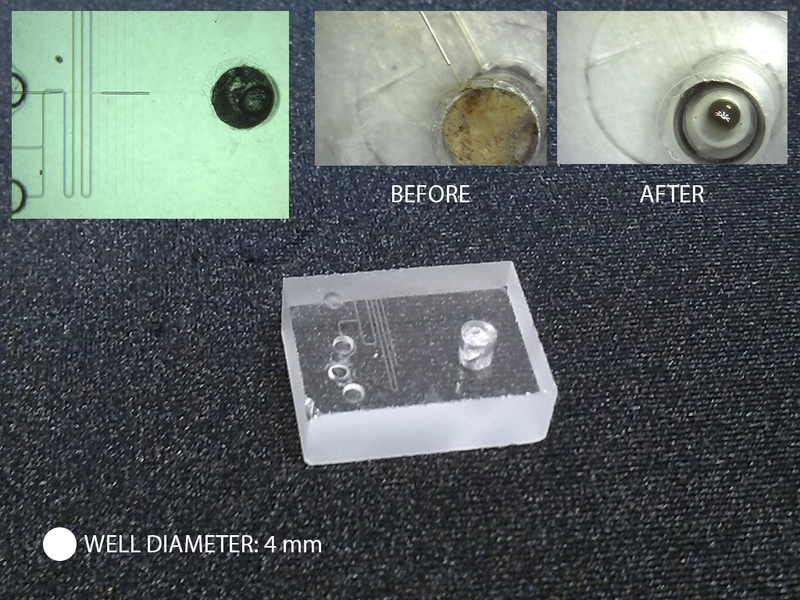 (Optional) After PDMS curing remove the dehydrated hydrogel layer with a tweezers from the PDMS negative replica (Fig 4A). 6. (Optional) Treat the PDMS replica with O2 plasma and bond the chip to make it ready to use (Fig 4B). CONCLUSIONS: In this tip a double replica of PDMS was obtained by the use of an intermediate layer of gelatin. Spin coating or other thin layer deposition techniques ensure the manufacture of a very thin hydrogel layer which preserves the initial geometry of the microstructure by changing the gelatin concentration. Furthermore the dehydrated hydrogel layer ensures a biocompatible coating of the microstructures. 1. H. Becker and C. Gartner, Electrophoresis, 2000, 21, 12-26. 2. Y. N. Xia and G. M. Whitesides, Angewandte Chemie-International Edition, 1998, 37, 550-575. 3. S. Brittain, K. Paul, X. M. Zhao and G. Whitesides, Physics World, 1998, 11, 31-36. 4. L. Gitlin, P. Schulze and D. Belder, Lab on a Chip, 2009, 9, 3000-3002. 5. M. E. Wilson, N. Kota, Y. Kim, Y. D. Wang, D. B. Stolz, P. R. LeDuc and O. B. Ozdoganlar, Lab on a Chip, 2011, 11, 1550-1555. How to remove plasma-bonded PDMS from glass? Why is this tip useful? It allows to remove and bind different PDMS structures many times to one and the same glass surface. It is especially useful for electrochemical measurements where the glass surface is coated with metal electrodes [1,2]. It allows to test different channel geometries on one and the same electrodes which saves money and time required for depositing new electrodes. If the channel is clogged, damaged or simply we want to do electrochemistry with different channel geometry, we do not have to make new electrodes on glass. We can remove the unwanted PDMS structure and re-use the glass plate with the new channels. Concentrated H2SO4, glass pipette, glass beaker, tweezers, gloves and lab glasses to work with concentrated H2SO4. Put the PDMS chip in a Petri dish (Figure A). With a glass pipette, add concentrated H2SO4 along the edges of PDMS (Figure B). Leave the chip in contact with H2SO4 for a few minutes. Gently peel off PDMS from the glass using tweezers (Figure D). Wash the glass plate with water. The glass plate is ready for plasma-binding to a new PDMS structure. D. Kaluza, W. Adamiak, T. Kalwarczyk, K. Sozanski, M. Opallo, M. Jönsson-Niedziolka, Langmuir 2013, 29, 16034-16039. D. Kaluza, W. Adamiak, M. Opallo, M. Jönsson-Niedziolka, Electrochim. Acta 2014, 132, 158-164. 1Mesoscale Chemical Systems Group, MESA+ Institute for Nanotechnology, University of Twente, The Netherlands. 2Medical Cell BioPhysics Group, MIRA Institute for Biomedical Technology and Technical Medicine, University of Twente, The Netherlands. Most common way to handle and transport reagents in chemical or biological labs is by using a pipette. However, tubing connection is generally used for the delivery of reagents into a microfluidic device. Even though the connection with commercial tubing and connectors allows various choices on the sizes and materials of the tubing and easy connection, difficult sampling from stock solutions, dead volume in tubing and connectors, and extra sterilization on tubing and connectors for biomaterials, still remain challenges. 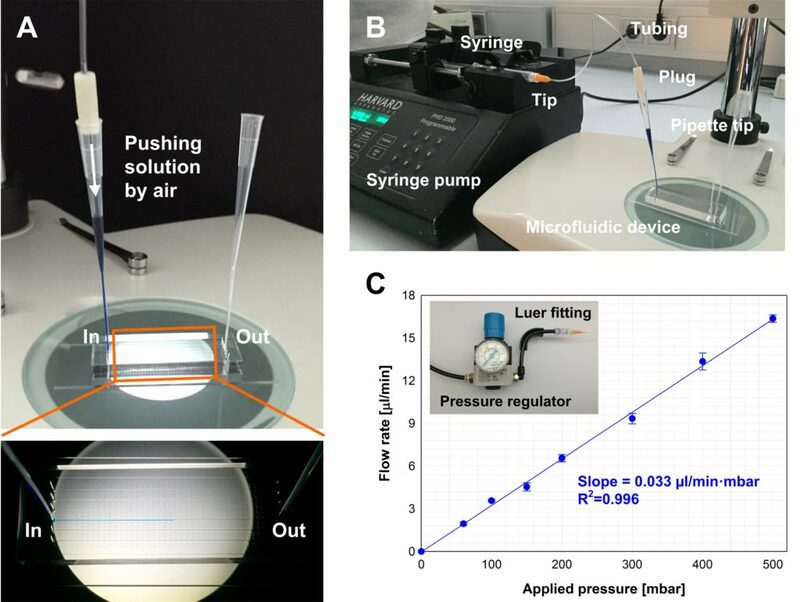 Here we demonstrate a direct connection of pipette tips to a PDMS device and loading reagents by pressure driven flow. 1. 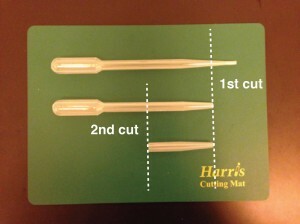 Select the size of a puncher based on the size of a pipette tip will be connected. 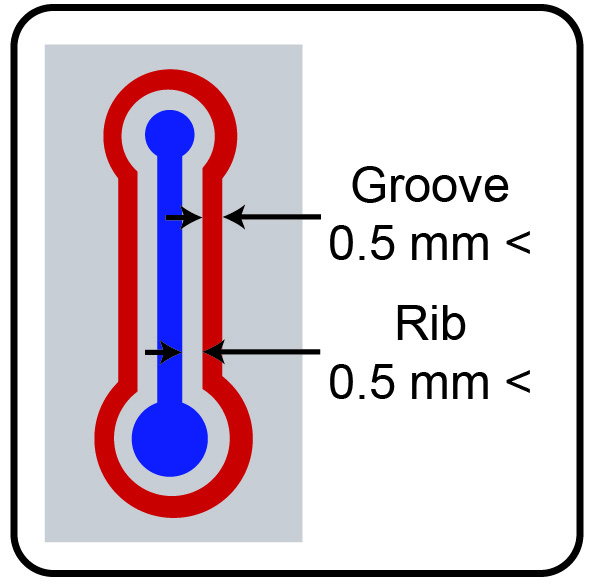 We achieved tight connections of pipette tips on a PDMS substrate when we punched holes by using punchers with outer diameter of 2.4 mm, 1.8 mm, 1.3 mm, and 1.0 mm for 50 – 1000 µl, 2 – 200 µl, 0.5 – 20 µl, and 2 – 200 µl (capillary) pipette tips, respectively. Fig. 1 Direct connection of pipette tips on a PDMS device. 1. Separate a pin from a precision stainless steel tip. The pin can be easily removed by twisting the plastic part while the pin is held by pliers. 2. 3D-print a plug. The outer diameter of the plug depends on the size of the pipette tip that will be connected. 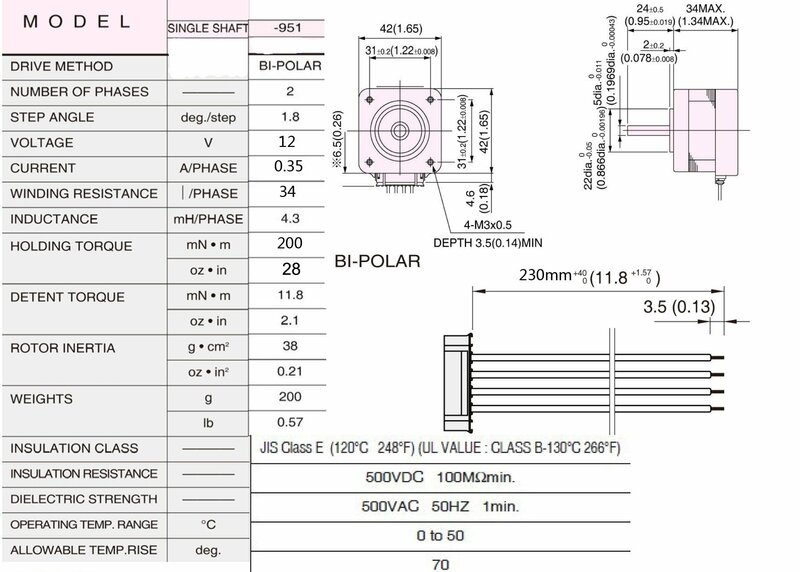 The detailed dimensions of the plug are shown in Fig. 2. 3. Connect a precision stainless steel tip, tubing, a pin, and a plug. Because the plastic part of the tip is luer tapped, it can be connected to male luer connectors and commercial plastic syringes. Fig. 2 Tubing connection with a 3D-printed plug. 1. Pipette the sample, connect the pipette tip into the inlet of a PDMS device, and take off the pipette. When an empty pipette tip is connected into the outlet of the device, the sample from the outlet can be collected in the tip. 2. Insert the plug into the tip and connect the tip to a pressure source. When pressure is applied into the pipette tip, the solution in the tip is pushed into a microchannel (Fig. 3A). The luer tip can be connected to a syringe and a syringe pump can be used as a pressure source (Fig. 3B). The flow rate of the sample solution can be controlled by the syringe pump. The luer tip also can be connected to a pressure regulator with a luer fitting. Fig. 3C shows the flow rate of sample loading at various applied pressures controlled by a pressure regulator. In this case an external gas source is required. 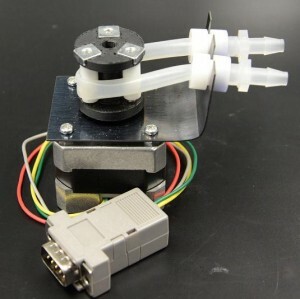 However, this system is cheaper than commercial microfluidic flow control systems. Also a digital pressure regulator can be used for accurate flow rate control at the low flow rate regime less than 1 µl/min. Fig. 3 A. Loading blue food dye solution into a microchannel, B. Solution loading by a syringe pump, and C. Solution loading by using a pressure regulator. No leakage of the solution was observed in the connection of a pipette tip onto a 1mm thick PDMS substrate. However at least a thickness of 3 mm is highly recommended to achieve tight fitting and stable support for the pipette tip. The pin obtained from a precision stainless tip is very useful for tubing connections. 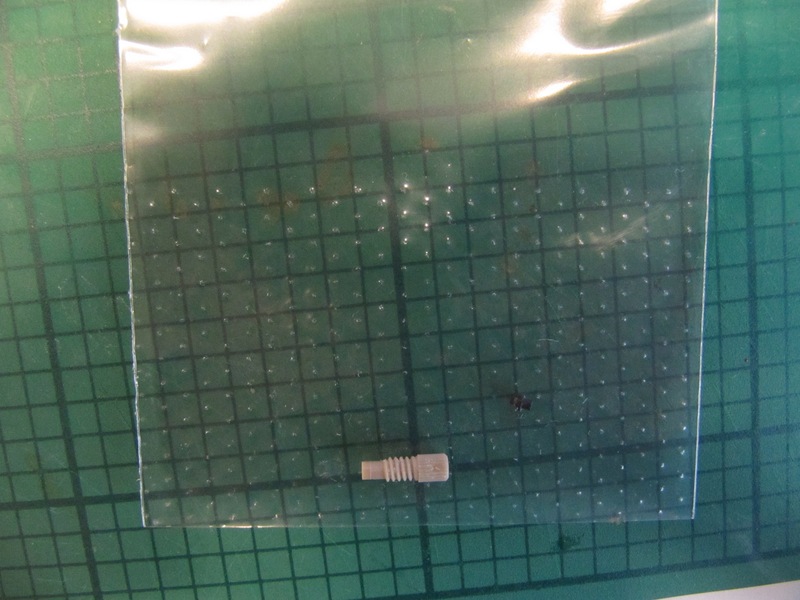 For example two separated tubes can be connected by the pin and also the pin can be inserted into an inlet or outlet of a PDMS device punched by a puncher with an outer diameter of 1mm. Also the pin can be easily bent by using pliers for compact connection to a PDMS device. Fig. 4 Tubing connection by using the pin from a precision stainless tip. Syringe pumps are the most popular tool for transporting fluids within microfluidic devices. 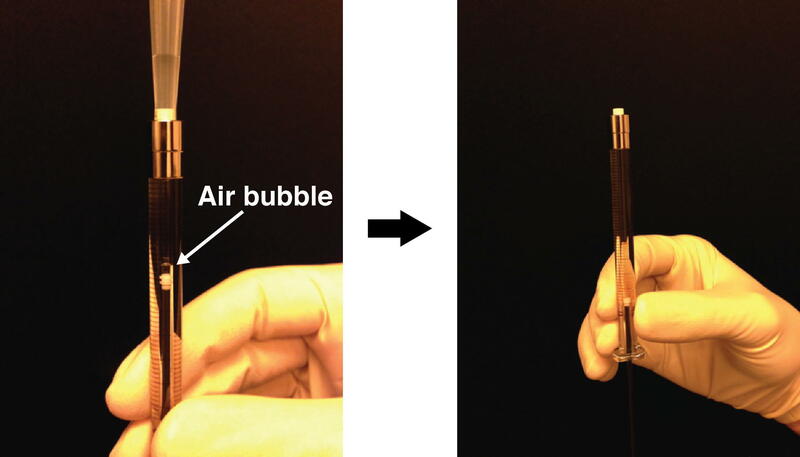 In the process of loading sample into a syringe, air bubbles (derived from the syringe dead volume) frequently migrate into the barrel and require removal to achieve consistent flow. Ideally, a researcher would have a large excess of sample so that the barrel can be filled and evacuated multiple times. During loading, syringes are held vertically with the sample directly below the tip, necessitating forceful evacuation to dislodge rising bubbles, however this not feasible for low/intermediate-volume “precious” samples (50-500 µL). 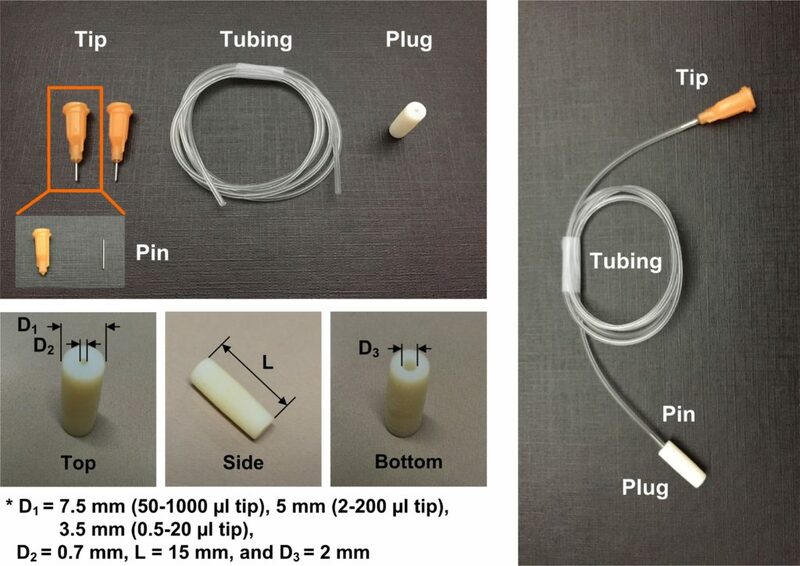 Here, we present a simple funnel to aid bubble removal during syringe loading. 1. Using the razor blade, carefully cut the end off of the transfer pipet so that it fits snugly over the tip of your syringe (Fig. 1). It might take a couple tries, but you can use this as a template once you have found the right location to cut. 2. Cut the transfer pipette again, roughly 2 inches up from the previous cut (Fig. 1). Your funnel is complete. 3. Attach the funnel onto the tip of the syringe. Holding the syringe vertically (funnel up), load your sample into the bottom of the funnel (Fig. 2). 4. Fill and evacuate the syringe barrel as needed to eliminate any air bubbles (Fig. 3). 5. Dispose of the funnel. Figure 1. Construction of a syringe funnel from a transfer pipet. Figure 2. The funnel is attached to the syringe (left), and sample is loaded into the bottom of the funnel (middle and right). Figure 3. Air bubbles in the barrel are expelled into the funnel and syringe is filled. With several microfabrication techniques now available, including: 3D-printing,1 micromilling,2 and hot embossing,3 in-house fabrication of thermoplastic microdevices has become cheaper, faster, and easier. However, for many applications – such as cell culture and microscopy – these devices must be bonded to optically-transparent substrates such as glass. While bonding similar materials, such as Polystyrene (PS) to PS, is relatively simple, bonding dissimilar materials, such as PS to glass, presents a particular challenge. 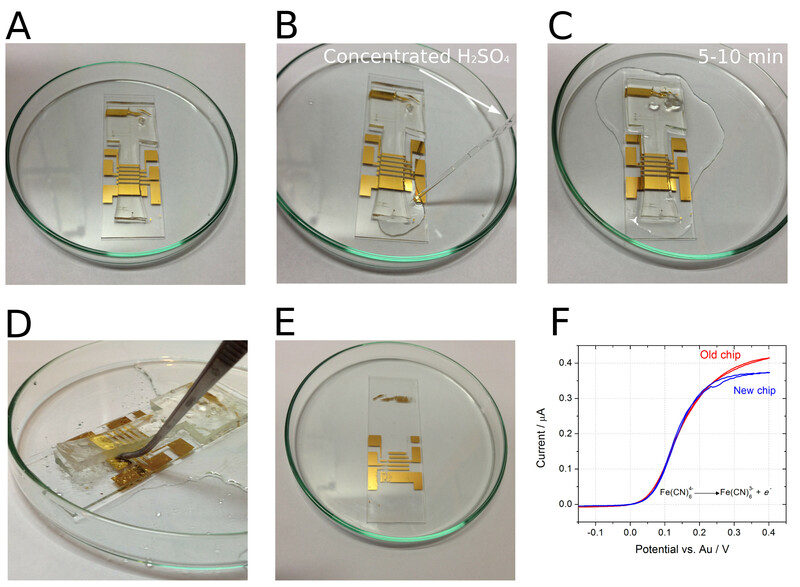 Current methods to circumvent these challenges include spin coating adhesives, such as polydimethylsiloxane (PDMS), onto sacrificial substrates4 and injecting adhesive directly into the bond interface.5 However, equipment requirements, associate long cure times, heterogeneity in glue uniformity, and complexity limit acceptance of these techniques. Here we present simple technique for applying uniform layers of adhesive to enable rapid – less than a minute – bonding of PS to glass. Using UV-curable adhesives, readily accessible materials, and a simple techniques, we demonstrate how to apply thin uniform layers of adhesive to a microchannel. We provide design suggestions that will improve bonding repeatability, and additional information that may help apply this technique to materials beyond PS and glass. Adhesives are often material-specific. Consult the manufacturer to determine the best adhesive for your application. Tip: Some adhesives may require post-treatment / aging to reach a full cure. We have tested this protocol with Ultra Light-Weld 3025 (Dymax) and Norland Optical Adhesive 68 (Thor Labs, Inc.). These adhesives had similar performance, however the protocol may need to be tailored for other adhesives. If the adhesive is too viscous or does not adequately wick around the rib, heat may be applied to achieve thinner adhesive layers, or to improve the wicking of the adhesive. This protocol is amenable to wide variety of materials, including: cyclic olefin copolymer (COC), glass, metal, PS, and various rapid-prototyping materials. Creating the rib and allowing the adhesive to wick eliminates excess adhesive and prevents adhesive from squeezing into the microchannel. Step 1: Fabricate the microdevice. 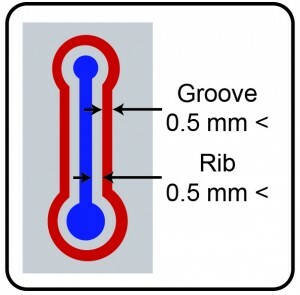 To improve bonding repeatability and adhesive distribution we recommend fabricating a groove (thickness > 0.5mm) around the channel – leaving a rib (0.5 mm < thickness < 1.5 mm) around the perimeter of the channel. Step 2: Thoroughly clean the surface of the microdevice, silicone foam sheet, and coverslip using isopropyl alcohol and low-particulate wipers. Remaining particulates can be blown off with compressed air. Ensure PS and glass surfaces remain clean throughout the bonding process. Step 3: Apply a dollop of UV curable adhesive to the foam sheet. Step 4: Use a tongue depressor to spread the adhesive into a uniformly thin layer across the foam. The area of the adhesive should be larger than the microdevice – add more adhesive if necessary. Step 5: Position the device onto the adhesive bonding surface down. Press down gently; avoid sliding the microdevice to prevent build-up of adhesive within the channels. Pick up the device and repeat this step two or three times to ensure the bonding surface is completely covered with adhesive. Tip: Take care to ensure no adhesive is transferred from gloves to surfaces of the device not intended to be bonded. Step 6: Position the microdevice above the coverslip, and gently lower it until it makes contact. Once contact is made, release the device, taking extra caution to avoid sliding the microdevice. • Adhesives are often material-specific. Consult the manufacturer to determine the best adhesive for your application. • We have tested this protocol with Ultra Light-Weld 3025 (Dymax) and Norland Optical Adhesive 68 (Thor Labs, Inc.). These adhesives had similar performance, however the protocol may need to be tailored for other adhesives. • If the adhesive is too viscous or does not adequately wick around the rib, heat may be applied to achieve thinner adhesive layers, or to improve the wicking of the adhesive. • This protocol is amenable to wide variety of materials, including: cyclic olefin copolymer (COC), glass, metal, PS, and various rapid-prototyping materials. • Creating the rib and allowing the adhesive to wick eliminates excess adhesive and prevents adhesive from squeezing into the microchannel. 1. Au, A. K., Lee, W., Folch, A., Lab Chip, 2014, 14(7), 1294-1301. 2. Guckenberger, D. J., de Groot, T., Wan, A. M.-D., Beebe, D., & Young, E., Lab Chip, 2015, 15(11), 2364–2378. 3. Young, E. W. K., Berthier, E., Guckenberger, D. J., Sackmann, E., Lamers, C., Meyvantsson, I., Beebe, D. J., Analytical Chemistry, 2011, 83(4), 1408–1417. 5. Lu, C., Lee, L. J., & Juang, Y. J., Electrophoresis, 2008, 29(7), 1407–1414. 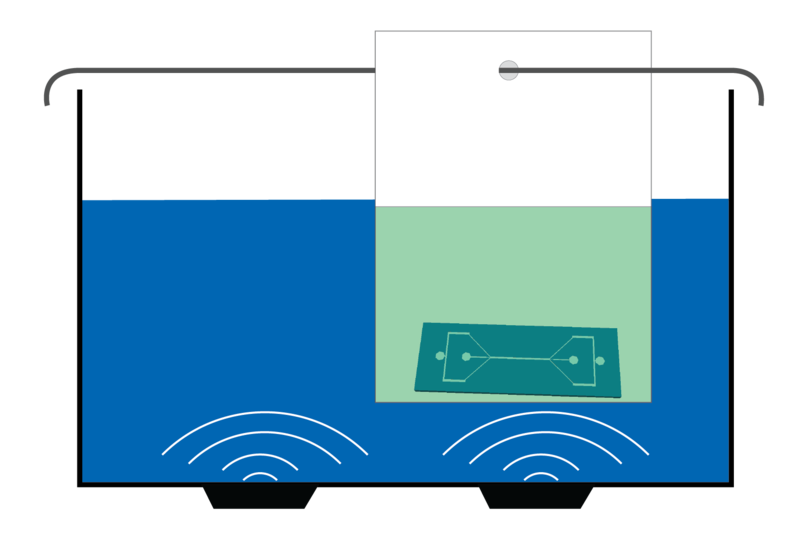 The majority of microfluidic applications require an external pumping mechanism. Multi-channel, individually addressable pumps are expensive, often large, and prone to failure when operated inside cell culture incubators at 95% humidity. The number of experiments that can be run at a given time is limited by the availability and expense of pumps. Perfusing artificial tissue scaffolds containing engineered vasculature requires long-term (days to weeks) continuous flow at low rates. We designed an inexpensive (~$100 for 2 pumps, ~$70 for each additional set of 2 pumps) peristaltic pumping system using an Arduino- controlled stepper motor fitted with a custom 3D-printed pump head and laser-cut mounting bracket. Each pump has a footprint roughly that of the NEMA 17 stepper motor and is easily controlled individually using open source software. Up to 64 motor shields can be stacked for a given Arduino Uno R3, each capable of supporting two stepper motors, and thus has the expansion potential to control 128 pumps in parallel. We have successfully implemented two stacked motor shields driving four independent stepper motors. Flow rate is dependent upon both tubing diameter and step rate. We found flow rates to range between ~50-250 μl/min for 1/16” tubing and ~500-1500 μl/min for 1/4″ tubing. We anticipate that this pump design will likely prove more resilient to incubator humidity compared to standard peristaltic pump powered by DC motors. Since implementation, these pumps have functioned without fail for 3 months (intermittent) under humid conditions. In the event of failure, however, cost of motor replacement is an economical $14. Cut three 15 mm (length) sections from rigid ¼” tubing to serve as rollers. 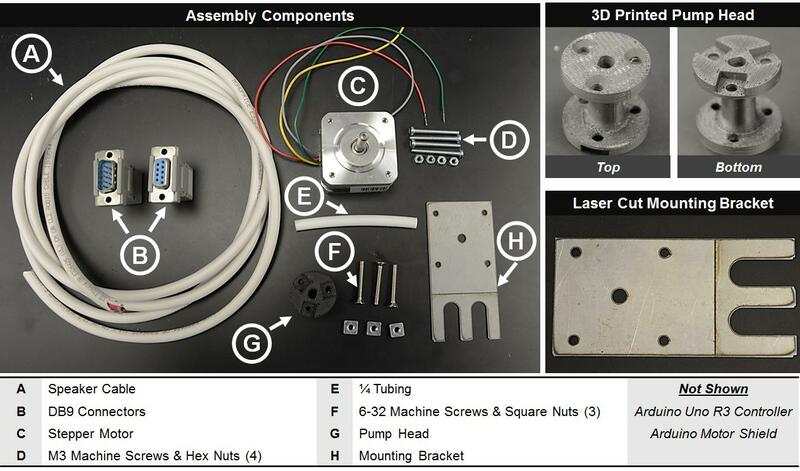 Use the three 6-32 machine screws and square nuts to assemble the tubing to pump head as shown in Figure 3. Using bracket template file (2000 Pump Mount v4) and laser cutting facilities, produce a mounting bracket from spring steel, or other appropriate metal. Note that the score line bisecting the bracket is intended to be cut at a lower power. This line is just a marker to show where to bend the bracket in the following step. Using handheld butane torch, heat mounting bracket along score line and bend with pliers. Repeat until mounting bracket forms a right angle (see Figure 1). Use M3 machine screws to attach mounting bracket to stepper motor, with corresponding hex nuts as spacers between motor and bracket. Press fit pump head onto rotor shaft. Follow assembly instructions provided by adafruit.com (https://learn.adafruit.com/adafruit-motor-shield-v2-for-arduino/stacking-shields). See also Figure 5.